2 December - A couple of months of neglect have been puncuated by moments of activity as I cleared dead plant materials. I still see the occasional frog around the pond but these sightings are less than this time last year. Perhaps the very wet conditions have been too much even for the frogs! 9 December - An 'empty' photograph for today's entry, the gap in the picture being typical of a number around the edge of the big pond. These small clear areas mark where the resident frogs spend some of their time, especially at night at this time of year. 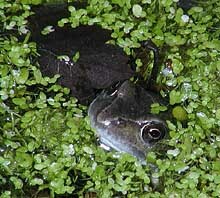 Just before 6pm I took this picture of a frog in typical pose at another of these gaps in the weed. At that time the water temperature was just under 3C and the air temperature just above the pond had dipped to -1C. Last night I spotted four frogs in the two ponds. The thickness of the duckweed reminds me that I must get on with some more pond clearing over the next couple of weeks. When I consider that the first frogs and newts will start arriving for next Spring's spawning by the middle of January, I do not want to be causing any undue disturbance at that time. Also, with frogs in residence right through the Winter I do not want to carry out a 'major' clean-out at any time. Instead, I prefer to stagger the clearing, concentrating on just one part of the pond at a time. 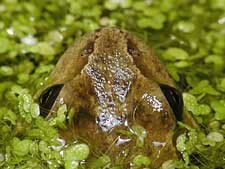 Rather than attempting to remove the duckweed (for example), I will be thinning the floating weed so that most of the water retains a covering that can still be used by the frogs and newts. During the weekend I had an e-mail from Jacki Stokes from the Reptiles & Amphibians Group for Somerset (Somerset Wildlife Trust) about the matter of Spring Cleaning wildlife ponds. I entirely endorse her words 'that you should never spring clean a pond' after the beginning of February and before September, although, based on my experiences I would change that to 'not between the middle of January and the middle of October'. 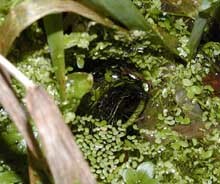 During all periods removal of pond materials should only be undertaken with great care, especially if there are newts in your pond as their eggs and larvae are very easily overlooked. Even at this time of the year great care needs to be taken to avoid unnecessary losses - last year's diary records immature newts being found in November and December. 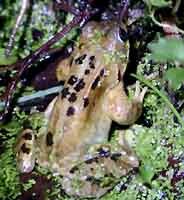 12 December - A brief entry without pictures just to note that tonight, with the air temperature above the pond at 6C and the water at 4C there were eleven frogs active in the two ponds at 10pm. 13 December - With both the air and water temperature up to around 6C there were 24 frogs to be seen (including several in groups) in the two ponds at 9pm tonight, most of them like this one - nose held high into the air and nearly all aimed towards the bank. 19 December - Since the 13th I have not seen as many frogs about, usually there have been around 15 seen in the late evening. Tonight at 10pm I checked the pond and after two cold nights the water temperature is down to 2C (with the air just above the pond at -1.3C) and I spotted just two frog snouts above the water. 22 December - At last I got round to doing a bit of pond-weed thinning today. As usual, it was a case of taking out clumps and putting them into a tray to check for animals. Care paid off when I found this dragonfly nymph in the floating weeds. It is the largest I have found in my ponds, and belongs to the family Aeschnidae (the hawker dragonflies). With the help of another very helpful subsciber to uk.rec.natural-history it has been identified as a Southern hawker (Aeshna cyanea). It is still in a tray tonight and if I have chance tomorrow I shall try to photograph the head to show some detail of its mask. Looking back to my entry for 1 September 2001 there is a picture of a Southern Hawker laying eggs on the log in the pond, but this nymph looks a bit too big to be from that time. 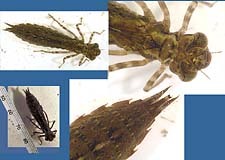 The water contained plenty of active crustaceans, including Gammarus and Asellus species, and large grey flatworms. I must get round to taking some pictures of these - they have been neglected for too long. At 9pm, the water temperature in the big pond was nearly 8C, with the air temperature at 7C. I counted 17 frogs in sight in the two ponds with a number of them almost completely out of the water, a sign of the relatively mild conditions. This one was heading off into the undergrowth as the picture was taken, so it is not as sharp as it could have been. 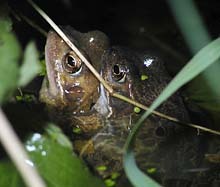 A bit of late news (at 10.15pm) - Another look at the ponds revealed this pair in a tight embrace. We may well have past the shortest day now, but this is not behaviour that I would have expected to see until at least the middle of next month! Well, after the bright weather yesterday, today has been dull and mostly wet. With an air temperature of 10C at 4.30pm, the water in the big pond is at 9C. One of my Christmas presents was a couple of pairs of tough, arm length water-proof gloves for me to use when pond cleaning! I put them to good use today as I spent a short time clearing a bit more weed from the pond. The star find during this session was this young newt, measuring about 32mm in length and still bearing a feathery set of external gills - A very fragile lillte creature, and another reason why cleaning of garden wildlife ponds needs to be done with great care. 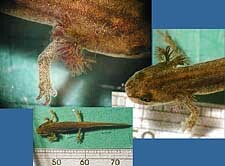 Looking back at last year's diary reveals that in 2001 I found a young newt on 27 December. It was longer (40mm) and had much reduced external gills. It seems that overwintering in the pond is to be expected. A check of the pond at 8pm revealed some 28 frogs visible in the ponds, with several completely out of the water, and one couple in a not too tight embrace. 27 December - A 8.30pm check of the pond revealed 20 frogs tonight - the air temperature is about 9C and it is drizzling, at the end of a miserably damp day. 28 December - The frogs are in retreat tonight with only 15 in sight, noses only above the water, as the air temperature just above the pond has dropped to about 3C at 9.30pm. The pond water is at 6C. 29 December - At 10.45pm, and with the air temperature back over 10C tonight there were 34 frogs in sight - one embracing pair seen and five individuals out on the bank of the pond. 30 December - The rain that has poured down all day today and the already waterlogged garden is starting to turn into a swamp - at least the ponds are full. 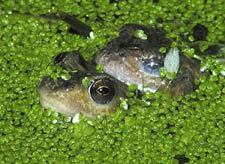 I ventured out at 9pm to check the pond and found 26 frogs tonight. There was a lack of smaller individuals - probably sheltering from the rain! The pond water has warmed up a bit today to 8C. I spotted this pair in the small pond. Notice the milky layer that is partly covering the right-hand frog's eye. This is the frog's nictitating membrane, which is an extra, transparent eyelid that is used to protect the eye under water. Presumably it is in use here because of the bits of duckweed and other plant debris that are touching the eye. When I returned to the house I was about to put my umbrella down when the beam of my headlamp lit up this surprise just outside the door. The weather is mild enough to have brought out this adult Common Newt to hunt for food (or to head for the pond). 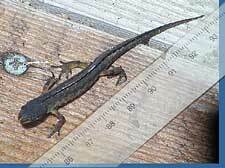 It was the end of January last year before I saw a newt in one of the ponds. It measures about 8cm long and the start of a crest along its back means it is probably a male (I did not pick it up to look more closely). Just a brief note about the measuring tape in the newt photograph - When an animal is actively moving about it isn't always convenient to position a ruler next to it. Toget round this problem I simply wait until it moves on and then place the ruler in the same spot and photograph it with the same lens set-up. The two pictures can then be blended together in the computer to provide the composite image you see here. In this case, the screw head and the gap between the planks provided a good means of alignment to ensure accuracy. 31 December - The pond ends the year on a quiet note with only eight frogs in sight at 8.20pm. The water temperature this evening is 6.5C and the air is at 4C just above the pond.